Highly geared towards innovation, OptinCollect is the ideal solution for all your data collection and online marketing needs. OptinCollect knows how to adapt perfectly to your needs while providing you with total cost control. We offer a variety of solutions, such as: Co-registration, Facebook Fans, Sponsoring, Collection Retargeting, Affiliation and E-mail Appending. These solutions are guaranteed to collect targeted audience data, qualitative and flexible, to increase your sales and brand visibility. Collect large amount of prospects in a short period of time. Co-Sponsoring : volume, speed and effectiveness. Do you need to quickly acquire, create or develop a database of prospects? 100% optin and 100% fresh. (A maximum of 3 co-advertisers, a net collection of deduplication on your database, etc.). Low prices(the lowest recruitment cost in the market). An ultra-targeted Co-Sponsoring:We conduct precise targeting of the profile of internet users you wish to collect (gender, age, geolocation, etc.). Co-Registration : synonym of quality. Do you need to acquire highly qualified prospects? Thanks to Co-Registration, we directly ask users to determine if they are interested in your brand, product or service. The prospects thus collected are highly qualified for maximum responsiveness to your commercial offers. Maximum visibility for your co-registration:Over 3 million unique visitors per month. An ultra-qualitative collection:The internet user chooses to receive your offer. We can also provide you with the full postal address and/or the telephone number if you wish. Retargeting Collection : global strategy. Is your database missing emails, profiles and personal data of your traffic? If so, you are going to love Retargeting Collection! Website administrators only collect e-mail addresses and personal data of internet users who subscribe to a newsletter or create an account (for example: upon placing an order). Therefore, the majority of website traffic is anonymous. Retargeting Collection (behavioural collection) is able to solve this problem by allowing you to collect: the optin email, title, last name, first name, date of birth, full postal address and the telephone number of internet users who represent the anonymous part of the traffic generated on your website. We identify and collect the emails and optin profiles of your anonymous traffic. A great response linked to the affinity with your brand. A cost uniquely linked to performance. A leverage of your sales. Retargeting gives you the ability to send e-mail offers to internet users from their initial visit to your website. Retargeting will identify these users, collect their addresses and deliver them to you. Do you need to collect highly qualified prospects while improving your visibility on the internet? Select a contest dedicated to your brand! Collection using Co-Sponsoring in affinity with your brand. Massive brand showcasing on the internet (up to 1,000,000 unique visitors to the competition). Full-service solution: OptinCollect handles everything from start to finish! Guarantee the ROI of your email campaigns. OptinCollect's expertise guarantees the firepower of our databases. With a database of more than 5 million qualified opt-in email addresses, OptinCollect will help you reach your commercial and web marketing goals. 5 million emails ofoptin partners. 12 million openingsper month (the guarantee of a high visibility for your campaigns). A socio-demographic database that represents the population of France. Ultra qualified database for targeted and optimum campaigns based on gender, age, location, interests, and / or purchase intentions. We broadcast your display campaigns! Would you like to diffuse your display campaigns on the internet? Choose to diffuse using OptinCollect's network! We offer tailor-made solutions suited to your needs and implement effective and sustainable strategies: traffic acquisition, lead generation, increased sales. Increase your visibility on the internet: launch CPM campaigns (tariff for 1000 impressions of your campaign). Collect qualified prospects: launch CPL campaigns (tariff for the generation of one lead). Acquire significant traffic: launch CPC campaigns (tariff for one click on your campaign). Generate your sales: launch CPL campaigns (tariff for the generation of one lead) or CPA campaigns (tariff for the generation of one activity or one purchase). Ultra-flexible offers to suit your needs. Diffusion of mailing campaigns exclusively on our own websites. Real-time campaign tracking to monitor performance through our interface. Standardise, update and complete your database. Does your database or client file need to be reviewed? Standardise, update and enrich it! Enjoy the benefits of your database enriched by OptinCollect. Optin Score : Optimise your deliverability. Do you think that your deliverability needs some improvement? With OptinScore, we clean, qualify and evaluate the emails in your database to maximize your quality! Your toxic email addresses (potential complaints, black-list,etc.). Your email addresses used on mobile phone or tablet. Your email addresses that do not conform to the RFC syntax.Or enrich the gender of your contacts(by correcting or completing your title information). The inversions of last name/first namein your database.The data: address, post code and town of your contacts. Maintain your reputation and email deliverability. Optimise the monetisation of your email databases by qualification. Each month, thanks to OptinCollect, several million email addresses and "opt-in" profiles are collected by advertisers, generating several million euros of revenue. Our innovative, efficient and effective solutions are sought by more than 500 customers across all industries. Their trust is the best proof that our expertise is recognised as being effective. Give us your problem, and we will offer a solution. We support you in all of your commercial and marketing initiatives by providing key solutions through innovation, responsiveness, creativity and expertise. OptinCollect attaches great importance to building trust through long-term relationships with it's clients, as well as it's partners. See some of our clients below. Implementation of an Email Appending campaign (enrichment of email addresses missing from the database of Citroën). Implementation of Co-Registration campaigns for the Kérastase brand, with 21,000 qualified leads already collected. Implementation of a Co-Sponsoring campaign, with 250,000 leads already collected. Implementation of a Retargeting Collection campaign (behavioural collection of visitors to the Spartoo website), with 75,000 qualified leads already collected. Implementation of Facebook fan generation campaigns: several thousand Facebook fans already collected. Implementation of a dedicated competition branded Voici within the context of a collection operation, with 130,000 leads already collected. Implementation of a Retargeting Collection campaign (behavioural collection of visitors to the Voici website), with 20,000 leads already collected. Implementation of an Email Appending campaign (enrichment of email addresses missing from the database of MMA). Implementation of Co-Registration campaigns, with 71,000 qualified leads already collected. 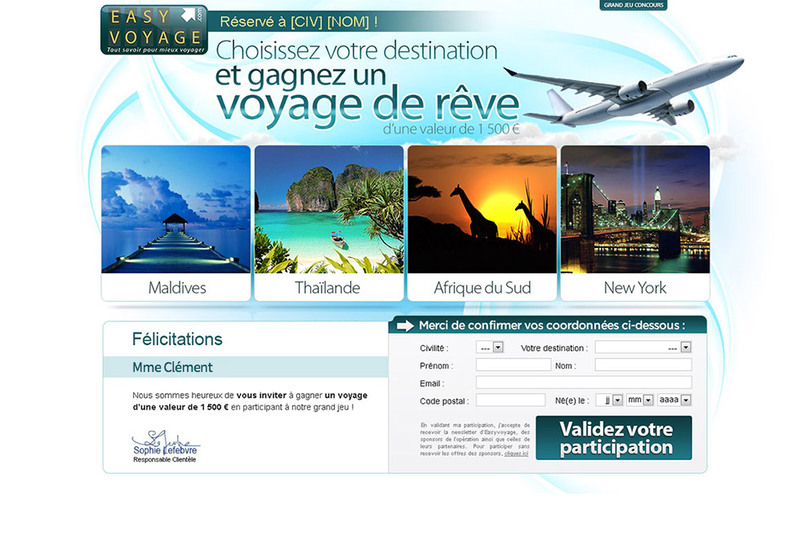 Implementation of a dedicated competition branded Qatar Airways within the context of a collection operation, with 100,000 leads already collected in France and Belgium. Implementation of several Co-Sponsoring campaigns, with 350,000 leads already collected. Implementation of several Co-Registration campaigns, with 35,000 qualified leads collected. Implementation of a Retargeting Collection campaign: 100,000 qualified leads already collected. Implementation of an Email Appending campaign (enrichment of email addresses missing from the database of Nocibé). Implementation of a dedicated competition within the context of a collection operation. Implementation of a Co-Sponsoring campaign, with 350,000 leads already collected. Implementation of a Co-Registration campaign, with 40,000 qualified leads already collected. Online sale of clothes for men, women and children. Implementation of a Co-Sponsoring campaign, with 150,000 leads collected. Implementation of Co-Registration campaigns: 555,000 qualified leads already collected. Implementation of a Co-Sponsoring campaign, with 400,000 leads already collected. Implementation of a Co-Sponsoring campaign, with 470,000 leads already collected. Implementation of Co-Sponsoring campaigns, with 171,000 leads already collected. Implementation of Co-Registration campaigns, with 112,000 qualified leads already. Implementation of a dedicated competition branded Easy Voyage within the context of a collection operation. Implementation of Co-Sponsoring campaigns, with 110,000 leads already collected. Implementation of Co-Registration campaigns, with 10,000 qualified leads already collected. Already 505,000 impressions in affiliation: implementation of joint email and display campaigns. Already 16,000 impressions in affiliation: joint implementation of emailing campaigns. Implementation of Co-Registration campaigns, with 16,000 qualified leads already collected. Implementation of Co-Registration campaigns: 40,000 qualified leads already collected. Implementation of Co-Registration campaigns, with 18,000 qualified leads already collected. Sale of trendy clothes to young adults aged 16 to 25. Implementation of Co-Registration campaigns, with 20,000 qualified leads already collected. Implementation of Co-Registration campaigns, with 19,000 qualified leads already collected. Implementation of Co-Registration campaigns, with 50,000 qualified leads already collected. Implementation of a Co-registration campaign, 15 000 qualified leads have been collected already. Implementation of Co-Sponsoring campaigns, with 100,000 leads collected. Implementation of a Retargeting Collection campaign (behavioural collection of visitors to the Megacinema website): with 10,000 qualified leads already collected. Implementation of display campaigns for the PlayVOD website, with 309,000 impressions already. Implementation of Co-Registration campaigns: 150,000 qualified leads already collected. Implementation of a Co-sponsoring campaign for the Express Roularta Group websites, already 170 000 leads have been collected. Implementation of a Co-registration campaign for the Express Roulart Group, more than 70 000 qualified leads have been collected. online sale of cooking utensils and accessories. Implementation of Co-Sponsoring campaigns, with 50,000 leads already collected. Implementation of Co-Registration campaigns, with 80,000 qualified leads already. Implementation of a Co-Sponsoring campaign, with 60,000 leads already collected. Implementation of Facebook fan generation campaigns: 20,000 Facebook fans already collected. Implementation of Co-Registration campaigns, with 100,000 qualified leads already collected. Implementation of a Collection Retargeting campaign (A collection campaign based on online visitor behaviour of the Nice airport), more than a thousand qualified leads have been collected. Implementation of Co-Registration campaigns, with 22,000 qualified leads already collected. Each client has different needs. This is why OptinCollect takes special care to offer you a customised solution tailored to your specific needs. To see some examples of client cases, click on the corresponding logo on your left. is to run faster than the others. An error occurred. Please check your form. OptinCollect works with many online players who wish to get closer to their clients. In this context, OptinCollect operates by offering its target collections services to its clients. What is my interest as an internet user? These targeted collections are adapted to your profile. They thus allow you to join clubs, to be informed of news about brands, to receive information, etc. They can thus respond to your need for information.